A gazebo is the perfect outdoor shelter to host backyard barbecues, summer soirees or casual family get-togethers. They offer an easy way to enjoy the fresh air while providing shade from the hot sun overhead. There are two main types of gazebos: hard-top and soft-top, and each one offers its own advantages. Soft top gazebos are generally less expensive, come in a variety of colors, and provide ventilation and cooler temperatures. Hard top gazebos offer good weather-resistance and are generally more durable and long-lasting. When shopping for the best gazebo to buy, you’ll need to decide what size of gazebo you need, how much assembly you’re willing to take on, and what type of wind and weather your gazebo will need to withstand. There are also wood gazebo kits that offer a beautiful cedar gazebo you’ll enjoy for years to come. Another popular style is all-season gazebos, which allow you to enjoy all four seasons from the comfort of your new outdoor space. Pick one of these 7 best gazebos and start making plans for your next outdoor occasion where everyone will enjoy the space and shade of your new structure! The Sunjoy Summer Breeze Gazebo is a great combination of functionality, style and value – and our choice for best overall gazebo. This 10-foot-by-10-foot gazebo is sized to accommodate a full patio seating area and offers plenty of shade for your family – plus a few friends. The frame is constructed of powder-coated steel, which is both weather-resistant and durable. The soft-top canopy is made of polyester, and users describe it as feeling thick and well-made. While some people have had to replace their canopy after several years of use, this is normal for the lifespan for soft-top gazebo canopies. The gazebo is available only with a beige canopy, but the look is neutral and appealing for most backyards and patios. Sunjoy uses an easy-assembly method called A.I.M to make it simpler to put the gazebo together. Most people who have assembled this gazebo agree that the process is relatively easy to understand and execute. Some say that if you can assemble a tent, you can assemble this gazebo. It still might be beneficial to have an extra set of helping hands, as many people point out the value of a helper during the assembly process. This gazebo has earned a lot of praise for its resistance to wind, thanks in part to its two-tier ventilated top and round support posts with sturdy bases. If you want a gazebo that assembles easily, looks great and holds up to weather well, then the Summer Breeze Gazebo by Sunjoy is an excellent choice. For a frill-free and budget-friendly gazebo, the Isabella Gazebo by Coolaroo is hard to beat. 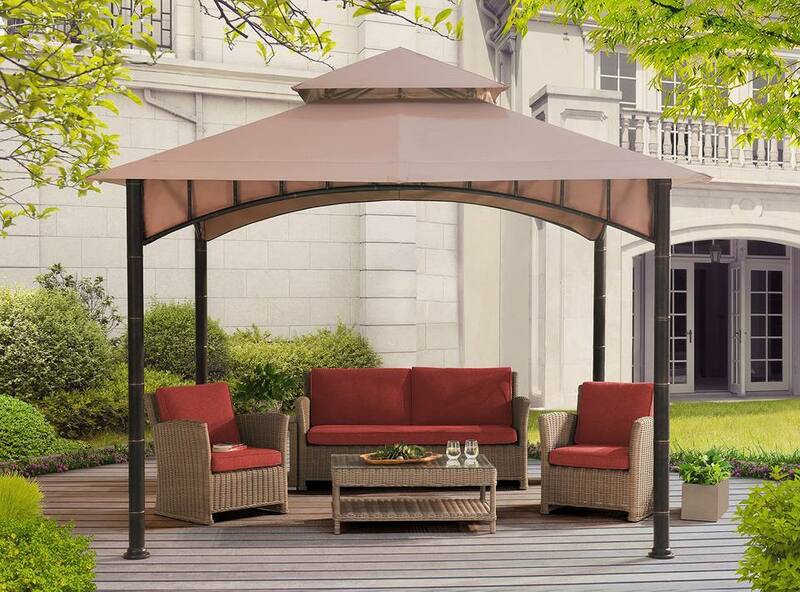 This basic gazebo is generously sized, with dimensions of 10 feet by 12 feet. It has an aluminum frame that is lightweight and sturdy. The canopy blocks up to 90 percent of UV rays, reducing your sun exposure and keeping the temperature cooler underneath the structure. Not all soft-top gazebos have UV-blocking sun shades, so this is an added bonus with this model. However, you can expect some frustration during assembly of this budget gazebo. Many people report creative solutions, including using tape to hold the poles in place during assembly, putting the canopy in the sun to warm up the fabric to make it easier to stretch, and more. Despite the struggle, most people report successful assemblies. And once it’s up, users have a lot of praise for the Isabella Gazebo. It withstands weather well for a soft-top gazebo, and it resists fading, according to some users. However, there are no side panels available for this model, so if you’re looking for something that offers drapes or netting, you’ll want to look elsewhere. If you’re a bit of handyman or a serious DIY enthusiast, you may be looking for a gazebo kit. The build-it-yourself San Marino 10-Foot Round Gazebo is an attractive choice. This traditional-looking wood gazebo is constructed of cedar, a wood species prized for its looks and natural weather-resistance. The kit also includes commercial-grade coated hardware to make the structure sturdy for years to come. However, some people found that they had to improvise a little during construction to provide reinforcement in several places on the structure. In general, though, most reviewers report that they really enjoy the finished product of the San Marino gazebo. What sets this gazebo kit apart is the ability to customize it based on your preferences for look, use and budget. Optional add-ons include a roof tier, a cupola, window screens and a floor. As reviewers note, this gazebo has been used as a serene sitting spot by a lake, a fun backyard retreat and an open-air venue for an outdoor wedding. If you want a reasonably priced, all-cedar gazebo kit, then the San Marino Round Gazebo is an excellent choice. Wind-resistance is a top concern for many people looking to purchase a gazebo, since you don’t want your structure to be damaged by a strong breeze or transplanted into your neighbor’s backyard. The Hampton Bay Harper Gazebo is a sturdy but pricey option. This heavy-duty gazebo features a double-roof design and all-steel construction to hold up to wind, rain and more. The steel is powder-coated to resist rust and provide a durable finish for years to come. In the face of wind, this gazebo is reported to be both sturdy and stable. One user even found theirs still standing after being subjected to hurricane-force winds (though the second roof tier and panels were removed to reduce wind-resistance). The point is that this well-designed, heavy-duty gazebo will hold up to all kinds of weather. This hard-top gazebo has a metal roof and is better for windy situations than most soft-tops. Soft canopies are subject to tearing or being inverted by strong winds. One downside to metal-roofed gazebos is that they trap more heat underneath the structure, but if you live in a windy place or want to leave your gazebo up year-round, this is a necessary trade-off. The Hampton Bay Harper Gazebo will offer you plenty of shade and will stay put on your patio in all sorts of wind and weather, making it a smart choice. Gazebos aren’t just for backyards and patios — they make a practical choice for camping, too! The Clam Corporation’s Quick-Set Shelter is a rugged-and-ready camping gazebo. This gazebo is 140 inches from hub to hub, meaning you have over 11 feet from one side to the other and 94 total square feet of space. The center height is 90 inches, providing plenty of clearance for the tallest users. As a camping gazebo, this model earns major points for its super quick and simple setup. The gazebo can be assembled in well under a minute and can be easily accomplished by one person. This camping gazebo is perfect for an evening meal without worrying about bugs, thanks to the fine mesh screens. It also has a 50+ UV rating, making it a great spot to get away from the sun in the heat of the day. One thing to note is that while the center of the shelter seems to stay dry, you may need to purchase additional wind panels for extra rain protection. Overall, though, the Clam Corporation’s camping gazebo is a rugged, durable choice for your next camping or outdoor adventure! If you want to enjoy your gazebo year-round, then you need an all-season model like this one from Gazebo Penguin. This metal patio gazebo measures 12 feet by 12 feet and features plastic film panels and mesh screens that allow you to see the beauty outside while staying comfortable inside. The panels are tinted to block UV rays, so you’ll want to make sure you install them with the right side up. Some people tackled the assembly and installation of this all-season gazebo as a DIY project, while others hired out the work. Either way, it seems the instructions were a little vague in places, but the process was still easily completed within a day or two. As for the usefulness of this all-season gazebo, one person reported that the gazebo has made it through four Northeastern winters successfully. Others comment on how much they enjoy their gazebo during summer. The only addition you may need to make is to add a ceiling fan for air circulation and to help you stay cooler during hot weather. Otherwise, this all-season gazebo is ready for every season! Keep flying insects and pests away with a gazebo that has netting, like the Sonoma Outdoor Gazebo with Net Drapery. This 10-foot-by-10-foot gazebo is equipped with both netting and curtains, providing you with protection from bugs and sun. You can choose to have the netting zipped shut and the curtains open, or close the curtains as well for extra shade and privacy. One thing to be aware of is the fact that the mosquito netting is subject to blowing in the breeze, since there is no weight at the hem of the netting. Still, most people find that it provides adequate protection against flying pests. The gazebo itself is reasonably sturdy and seem to draw criticism only for the fact that rain tends to pool on the canvas top. This is a problem with some soft-top gazebos and usually just requires that you push the rainwater off the surface with a broom or other long-handled tool.